Asynchronous programming model allows you to run and complete several tasks in a parallel way. Using this model can make your applications more responsive (non-blocking) but make no mistake, it’s a tricky road to follow. There are few different models for asynchronous programming such as the old APM Asynchronous Programming Model, the EAP Event-based Asynchronous Pattern and latest one, the TAP TASK-based Asynchronous Pattern which is also the subject of this post. The main class used in TAP pattern is the System.Threading.Tasks.Task which represents asynchronous operations. Asynchronous methods return either Task or Task<T> objects which in turn is not the real result but an ongoing task that is going to be completed at some point. You retrieve the actual result from a Task using it’s “Result” property. Let us see some real examples to understand how the TAP asynchronous model works. I will use the Chinook database which you can download and install it to your SQL Server from here. It’s not necessary though, you can adjust the respective queries we will write to point your preferred database tables. Create a new Console application in Visual Studio (i used 2012 version and .NET 4.5) and open the default Program.cs file where the main method is. 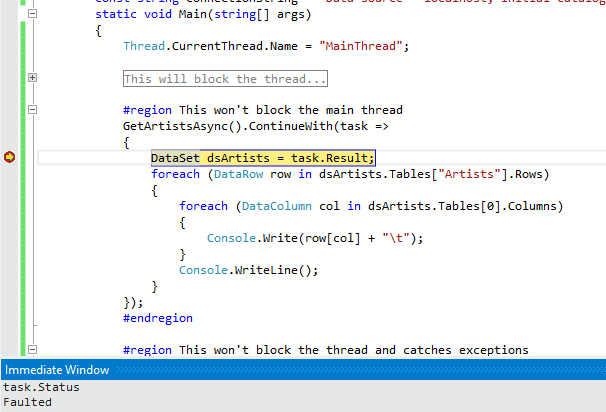 Add the following asynchronous method which returns a Task object containing the top 10 records from the Artist table. On purpose we set a 5 seconds delay so we can see how the method behaves. We use the StartNew function to start and create a new Task, passing to it a delegate as a parameter. Now let’s call this method in the main method. If you build and run your application you will get the following result. Let’s see what actually happened here. Not what we intended that’s for sure. What we wanted to see is while waiting for the GetArtistsAsync() to return, continue our execution in the main method, that is to see the content in the red box in the above picture to be printed first and then the results from our asynchronous operation. The reason why this happened is that you requested the GetArtistsAsync().Result directly. 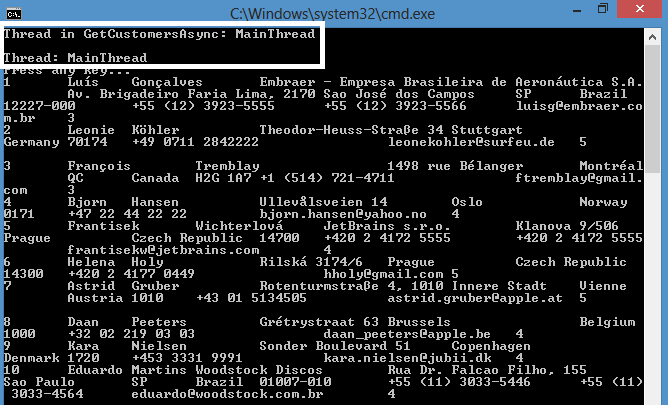 This in turn, blocked the current thread and returned only when it’s operation completed. Another important point to mention is that the Task.Factory.StartNew created a new thread which means we used multi-threading (that’s why they had different names), something you don’t always want to. We will get back to this issue later on this post. Let’s now see how to call the previous operation in an asynchronous way. Comment out or remove the “#region This will block the thread” and replace it with the following one. If you run your application again you will get the following result. Now indeed we didn’t wait for the asynchronous method to complete but we proceed our execution in the main method. When the operation completed we printed the results. We accomplished that using the ContinueWith() which creates a continuation that executes when the target Task completes. In other words, when we read the task.Result property inside it’s delegate, we are sure that the task has completed. In the ContinueWith() function you can pass some extra parameters in order to proceed with the returned Task depending to it’s final Status. For example, let’s on purpose change the select statement in the GetArtistsAsync so it fails. If you run now your application, you will see printed only the red box contents. Run it in debug mode if you want to see the Exception results. Notice that the task.Status was Faulted. You can tell inside the ContinueWith() function what you want to do depending from the task Status as follow. Now let’s try something more interesting. Assume that you have several tasks, and you want to proceed with the main execution till all of them have completed. 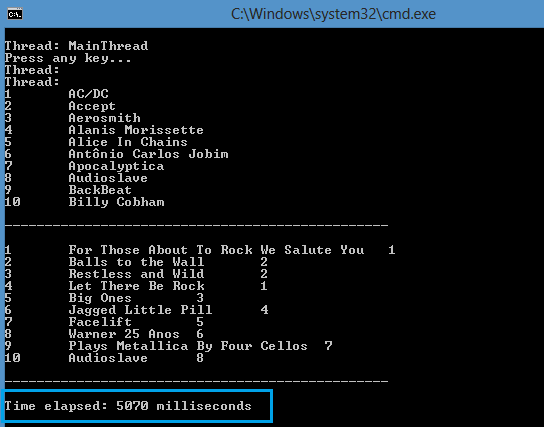 Add a new asynchronous method which returns the top 10 album records. Each operation needs at least five seconds to complete but mind that they are going to run in different threads. You use the Task.Factory.ContinueWhenAll method to wait for several tasks to be completed as follow. Here we print the results only and only if the task was completed successfully. Take a look at the time elapsed for the tasks to execute. Now let’s return to an issue mentioned before. Do we really want a different thread for our asynchronous operations? Well, some times yes but others no. So how we can accomplish this? We use the TaskCompletionSource class instead of the Task.Factory.StartNew method. Create a new asynchronous operation which returns the top 10 Customer records as follow. You can call it in the same way we called the others. This is the optimal way to call asynchronous methods without using multi-threading. That’s it, we saw some really interesting things in this post about asynchronous programming with the TAP model. I hope you enjoyed it, you can download the project we built from here. every onee is getting ore from this website, and your views are njce in favor of new users.